By the end of 2015, ThreatTrack Security knew they wanted to develop explainer videos for each of their cyber security solutions. But their first priority when they enlisted Autodemo was to build a demo video for their RSA Conference tradeshow booth. Time was of the essence when we began the project less than a month before the conference at the end of February. 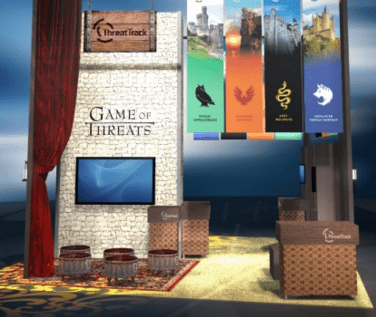 ThreatTrack’s marketing campaign and booth theme were built around Game of Threats. This creative approach drew on a familiar pop culture phenomenon to connect with tradeshow attendees and drive home the important messages around ThreatTrack’s unique advanced threat defense. Autodemo’s team of designers and producers are accustomed to developing unique creative treatments, but on this particular project, we were more than happy to leverage the visual elements and theme of our client’s existing creative campaign. With a well-defined creative approach, the video’s visual elements and soundscape came together quickly. Setting the mood with a big, ominous music score, the visual transitions and 3D gameboard perspective grab the viewer’s attention and set the perfect tone. Leveraging the medieval visuals of castles and continents, the cyber threat iconography replaces knights with battle axes and battering rams. ThreatTrack’s analogy of the game’s “houses” representing aspects of cyber defense, drove home the important messaging about how these solutions work together to overcome the varied threats. After the fun and informative 45-second introduction establishes the creative analogy, our demo video moves seamlessly to a current-day cyber threat scenario to show ThreatSecure Network in action. The viewer sees firsthand how the solution proactively detects and prevents threats. If you’ve walked a trade show floor, you know how loud and distracting they are. Autodemo worked closely with ThreatTrack to customize the video for optimal use at the RSA trade show. We created an alternate version that removed the professional audio track and adjusted the timing of the video to complement a live presenter at the show. When the presenter wasn’t speaking to a crowd of attendees, the video provided a visual spark to passersby who might not have taken notice of the theme and compelling solutions within the booth. ThreatTrack Security specializes in helping organizations identify and stop Advanced Persistent Threats (APTs), targeted attacks and other sophisticated malware designed to evade the traditional cyber defenses deployed by enterprises and government agencies around the world. With more than 300 employees worldwide and backed by Insight Venture Partners and Bessemer Venture Partners, the company develops advanced cybersecurity solutions that Expose, Analyze and Eliminate the latest malicious threats, including its ThreatSecure advanced threat detection and remediation platform, ThreatAnalyzer malware behavioral analysis sandbox, ThreatIQ real-time threat intelligence service, and VIPRE business antivirus endpoint protection. Learn more at www.ThreatTrackSecurity.com . Autodemo is the explainer and demo video leader. Our team of scriptwriters, designers and producers custom-build videos that increase awareness, leads and sales. Since 1998, Autodemo videos have helped hundreds of technology, healthcare and financial companies prove the power of their solutions. Clients include Red Hat Software, eBay, Optum, Expedia, CSC, and Marketo. Autodemo’s HQ is in a repurposed church in Louisville, Kentucky.